T.S. Eliot wasn&apos;t kidding when he said that April is the cruelest month. Super bloom flowers mix memory with desire, and my inbox floods with nonstop Coachella-themed press releases. I once thought that nothing would ever top the content and timing of the "Are You Ready For Truffle Season?" press email I received the day after Donald Trump was elected president, but I was wrong. The Coachella-Industrial Complex is upon us, and a small part of my soul dies with each new "Pack This In Your Coachella Satchel" entreaty (e.g. "In addition to those aviator glasses, a kimono, and necessary hair accessories, Coachella goers would be wise (and hip) to save room for a few bottles of Waiakea Hawaiian Volcanic Water in their satchels this year"). Here, in no particular order, are the the top eight products of the Coachella-Industrial Complex that most make me want to die. Hope everyone has a fun Festival Season! 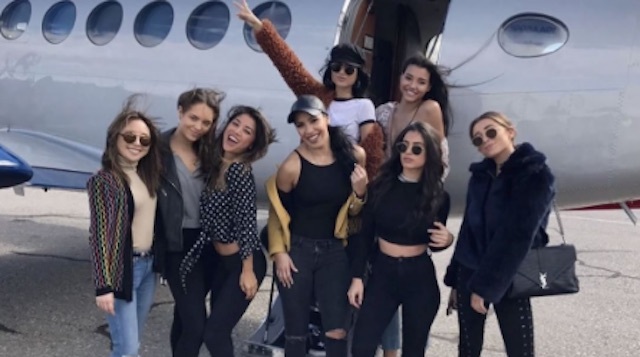 "A luxurious private jet experience is the perfect option for procrastinating festival-goers who haven&apos;t yet planned out their transportation," according to an email from JetSmarter&apos;s PR person. JetSmarter customers can book single seats on a private jet between Los Angeles and Palm Springs or Bermunda Dunes through the company&apos;s private jet booking app (which honestly sounds a lot like commercial air travel, except on a really small plane). Single seats on the JetShuttle are free for JetSmarter members, and start at $599 for non-members. On a long enough timeline, both members and non-members will be but dust and ashes. Khloé Kardashian&apos;s Good American denim line is being heavily marketed as "Coachella ready," because literally nothing says Festival Season more accurately than distressed denim that retails for more than a $100 a pop. Her pre-torn denim Bermuda shorts are already sold out because the Kardashians are the greatest business people of our time. The denim cutoff shorts are still available. Highlights of the capsule collection include the "Goa Waist Belt," $198 (brightly colored statement waist belt featuring stretchy corset-inspired adjustable laces with peacock appliques, metallic jacquard trim, gold-plated plastic beads, and pom pom detailing), the "Tibetan Sunrise Necklace," $48 (statement wood bead necklace featuring multiple layers and accented with brass bead and suede accents and adjustable lobster clasp closure) and "Amazonite Stone Fringe Chain Halter," $268 (handmade in Bali, this brass body chain features an oversized amazonite stone in front with statement fringe detailing). What else is there to say? 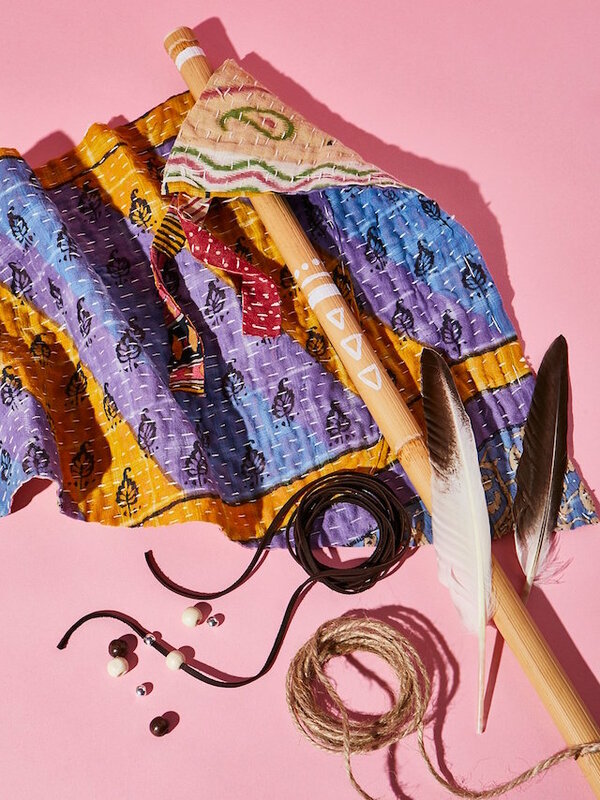 But Especially Free People&apos;s "Friend Finder DIY Kit"
It&apos;s hard to go two feet in the Festival Season world without stumbling on an offensive, vaguely Native American-inspired product, but this one is pretty next level, even within that context. I will not be able to top their description, so here it is: "Stand out in the crowd with this DIY Festival Flag featuring everything you need to mark your spot in style and make it easily identifiable to others in your group." Presumably both you and your friends would need to purchase it in order to use it as a way of finding each other, but waving it around could also be a good way to find other people who showed up at Standing Rock for the "cultural experience" and Instagram pictures. 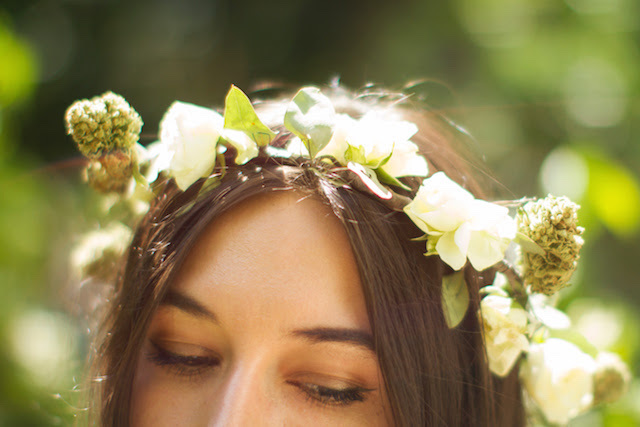 These limited-edition medicinal marijuana flower crowns feature Lowell Farms&apos; "Coachella Blend" weed strain, and contain a quarter ounce of smokeable cannabis. That you wear on your head. I guess that&apos;s one way to make friends? People Magazine&apos;s List of "The 11 Festival Essentials You Need in Your Fanny Pack for Coachella"
Remember when people used to say that something stopped being cool when it got written up in the New York Times&apos; Sunday Styles section? Well, if Sunday Styles is the kiss of death for cool, then we are pretty sure the People Magazine feature is the equivalent of making a courtesy visit to cool&apos;s grave, ten to fifteen years after the burial. Recommendations for fanny-pack inclusion include Crystal Geyser brand bottled water and Power Bars. Thanks, mom. What if you went to Coachella, but none of your friends on peer-to-peer money transfer app and burgeoning social network Venmo knew? Would that be the equivalent of not going at all? The philosophers are still debating, but, in the meantime, Venmo has stepped in to fill the void. "Coachella has been becoming more and more cashless throughout the years and Venmo, a peer-to-peer money transfer app, has played a huge role in helping friends pay each other back using their mobile phone, whether it be for tickets or for a bottle of water," the company says in a press release. If you have ever made any of your friends Venmo you for the bottled water they gave you in the desert, please contact us at tips@laist.com because we would really like to explore this dark phenomenon further (we play by NYT rules, so three emails and it&apos;s a trend story!). Regardless, we are excited to announce that, this year, Venmo has released festival-themed custom emojis because "Venmo has got your back in keeping your Coachella emoji game strong." Emojis range from wristbands to flamingo floaties, just to name a few, plus—of course—the aforementioned water bottle. Just kidding, this one is the best. God bless the law office of Stephanie M. Arrache and this extremely informative section of her website. Stephanie will be offering free consultations if you were arrested at Coachella and even created a Powerpoint-y YouTube video with tips on how not to get arrested at Coachella. But if push comes to shove and you find yourself in cuffs, call Stephanie. She knows what&apos;s up.